TEACHER'S NIGHTMARE: Retired teacher Jacob Brackish (Benjamin Lovell) discovers that the housekeeper (Alison Quairoli) he has hired to assist him in the final year of his life is a former student who failed his class and wants revenge, in Israel Horovitz's comic drama Park Your Car in Harvard Yard, playing at Off-Broadstreet Theatre in Hopewell through September 8. It’s a teacher’s worst nightmare: the student who failed the class, instead of just moving on and disappearing from sight and memory, returns years later to seek revenge. And it’s an angry student’s dream come true: finally there’s a chance to even the score with that harsh, elitist teacher whose oppressive grading made high school miserable and failure inevitable. Israel Horovitz’s Park Your Car in Harvard Yard, running through September 8 at the Off-Broadstreet Theatre in Hopewell, offers a poignant drama along with generous doses of comedy, as the toughest teacher in Gloucester, Massachusetts, in the last year of his life, comes to terms with his past in the persona of his vengeful new housekeeper. Under the able direction of Robert Thick, this odd-couple encounter provides rich material for two seasoned professionals: Benjamin Lovell as Jacob Brackish, a crusty, intellectual retired teacher of high school English and music, and Alison Quairoli as Kathleen Hogan, an emotional young widow, sentimental, irate and outspoken. Comedy and tragedy emerge in almost equal measure amidst their battles, as he reflects on his life in preparing to face his death and she comes to terms with her past in preparing to carry on with the rest of her life. Mr. Horovitz, author of more than 50 produced plays and several acclaimed screen plays, has been a significant presence in the New York theater scene over the past 35 years. He founded the New York Playwrights Lab in 1975 and still serves as their artistic director. 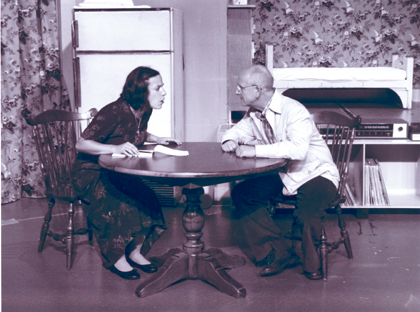 He also founded the Gloucester (Massachusetts) Stage Company in 1979 and served as artistic director through 2006. Park Your Car in Harvard Yard saw its New York premiere at the Manhattan Theatre Club in 1984, after successful preliminary productions in Los Angeles and Gloucester, then seven years later ran for nine previews and 124 performances on Broadway, starring Judith Ivey and Jason Robards. Mr. Horovitz’s play is a study in contrasts, an interesting examination of two characters who, despite clashing backgrounds, values, tastes, ages, and religions, find themselves cast together, forced to coexist, to seek out a reconciliation, and ultimately to share their common humanity. Israel Horovitz's "Park Your Car in Harvard Yard" will play at Off-Broadstreet Theater in Hopewell on weekends through September 8, with performances on Fridays and Saturdays at 8 p.m. and Sundays at 2:30 p.m., desserts served from one hour before show time. For reservations call (609) 466-2766, or visit www.off-broadstreet.com for further information. In the vein of Mitch Albom’s recent bestseller Tuesdays with Morrie (1998), Park Your Car offers a moving portrayal of a dying teacher’s relationship with a former student and the final lessons that this teacher imparts. In both works genuine sentiment risks over-reaching into the realm of less plausible sentimentality, a problem for the most part avoided at Off-Broadstreet by two strong performances and the sharp, reality-based humor. Some of the finest moments here explore the difficult struggles of both teacher and student in the endeavor of formal education. As Kathleen Hogan pursues her revenge on this elitist curmudgeon who not only destroyed her chances for a much-needed scholarship but also flunked her late husband and both of her parents, Brackish and Kathleen are forced to relive difficult episodes from their past and come to terms with hidden secrets. Both characters, in their bickering and battling, do some serious teaching and learning, before Brackish administers to Kathleen her “make-up test,” a second chance to prove herself many years after the original failure. Set in Brackish’s cluttered, two-story home in Gloucester, the action takes place in four scenes stretching from one winter to the next, the final year of the retired teacher’s life. Mr. Thick’s detailed, carefully designed and constructed set on two levels realistically renders Brackish’s kitchen, sitting room and two bedrooms where the protagonists can each retreat for escape and privacy. Mr. Lovell creates a memorably eccentric and engaging character. He delivers with energy and conviction his words of wisdom, his frequent corrections (grammatical and otherwise) to his housekeeper, his complaints about his uncooperative hearing aid, and his inspiring commentary on the teaching profession and on the works of Bach, Brahms, Mozart, Debussy and others whose music he plays in the background throughout the evening. Bespectacled, bald, intellectual, demanding and testy (“Saying you’re a hard man to please is kind of like saying a rattlesnake is a hard animal to hug,” Kathleen observes. ), Mr. Lovell’s Brackish commands the stage and his household too, at least until Kathleen’s rebellious anger rises to the surface and the conflict is in the open. Ms. Quairoli’s Kathleen carries a large chip on her shoulder, fuming in anger and resentment, seeking retribution for so many past disappointments. Thinking that the wily Brackish can’t hear her without his hearing aid, she insults and threatens him, and at every opportunity replaces his Bach and Vivaldi on the radio with James Taylor and Phoebe Snow. Ms. Quairoli is at her best when she finally comes clean and admits her plan for revenge—“I came here to watch you die.” The two clash dramatically, at first fiercely, and then openly and honestly in the scenes just before the sad, excessively drawn out conclusion. As the off-stage radio voice, Doug Kline provides an authentically folksy New England background to the action and an intermittent injection of dry humor to complement the lavish classical music soundtrack. Mr. Thick handles these music cues and additional sound effects, and all other production elements with customary polish and skill. This 196th production since its founding in 1984 opens Off-Broadstreet’s 2007-08 season with a welcome mix of the serious, the comic and the sentimental, in an intelligent staging of an entertaining play by an important contemporary playwright whose work seldom appears in central New Jersey.